The Sacramento Homeless Organizing Committee (SHOC) mission is to amplify the voice of the homeless and low income community to accomplish economic and social justice. 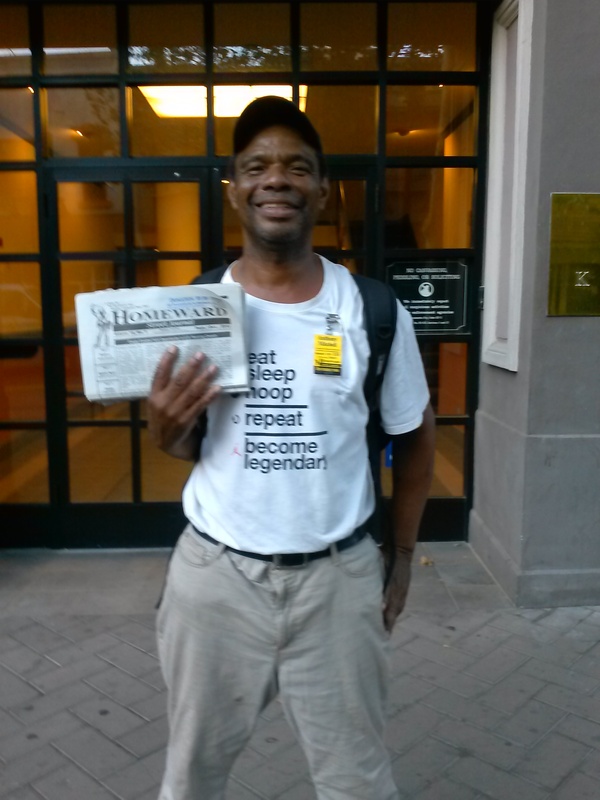 Homeward Street Journal educates the public on issues of poverty and homelessness, social justice, and features the work of SHOC and our community partners. We publish up to 8,000 papers every two months. The paper provides an income source to homeless and nearly homeless distributors, helping them to meet their immediate survival needs. In 2016, 21,890 papers were sold by distributors who received $1 or more for each paper from the public. We have had 73 distributors active in 2016. We share articles internationally through the International Network of Street Papers as members, but rely mostly on local writers. Homeless Leadership – Homeless people should have a significant voice and leadership role in shaping their future and have a voice in changing local, statewide and national policies on homelessness. Leadership development occurs within all our projects, but is specifically based in our Homeless Action Committee, where homeless, formerly homeless and supporters meet weekly to decide, plan, act and evaluate progress. We host workshops, facilitate field trips and speaking engagements, participate in civic and public meetings, organize events, write articles for Homeward and other documents. We have a garden committee that organizes the SHOC Community Garden at 13th & C Streets. Civil Rights Project helps ensure civil rights for homeless people. Locally, we seek to change laws that make it a crime to live outdoors (there are no alternatives for over 1,200 people) (Title 12.52). We focus on other laws and unfair treatment, including property rights. We organize letter writing campaigns, community education, rallies, marches, visiting civic meetings and leaders. We collect incident reports from those with complaints against law enforcement for monitoring purposes and to share with attorneys. We conduct surveys to inform us of what work is most important to pursue. We are working with Western Regional Advocacy Project on a Homeless Bill of Rights Campaign for state legislation that would ensure homeless people have the right to move freely, rest, sleep, share food, occupy a vehicle, and pray in public spaces–those rights are increasingly being denied nationally. Homelessness and Housing. We speak out for housing, shelter, food access, and other survival services as a human right. We join and support other groups, such as Sacramento Housing Alliance and Safe Ground Sacramento, on advocating for affordable housing. We also instigate our own work when the SHOC members decide to address a specific housing or program issue. Housing is the answer to ending homelessness, and that is our ultimate goal—to end homelessness. Coalitions and Partnerships: We are organizational members of Sacramento Housing Alliance (our fiscal sponsor), Western Regional Advocacy Project, and the International Network of Street Papers. Many SHOC board members sit on various other boards and community groups, such as Safe Ground Sacramento, National Health Care for the Homeless CAB, Sacramento County Health Center, Sacramento Loaves & Fishes, Women’s Economic Agenda Project, and more. Our office is located on Friendship Alley in Sacramento close to the central city. We rent an office in Loaves & Fishes’ Friendship Park where over 600 homeless and nearly homeless guests visit each day for survival services. I don’t know if I replied to you comment. Sorry if I didn’t. We meet most every Wednesday at 10am at the Delany Center at Loaves & Fishes. That’s where we plan what we do. We have a couple members that are with Your Sacramento Arts and Rev that do street theatre. You can find them on Facebook and get involved with them directly that way. I want to serve. I can fundraiser, do community outreach, educate. I have a theater background.